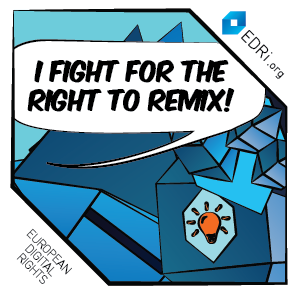 In the field of EU copyright policy, there are two European Parliament own-initiative reports (which will become a non-binding non-legal resolution) which EDRi is following closely. Firstly, there is the report on the implementation of the so-called “InfoSoc Directive” by Julia Reda. 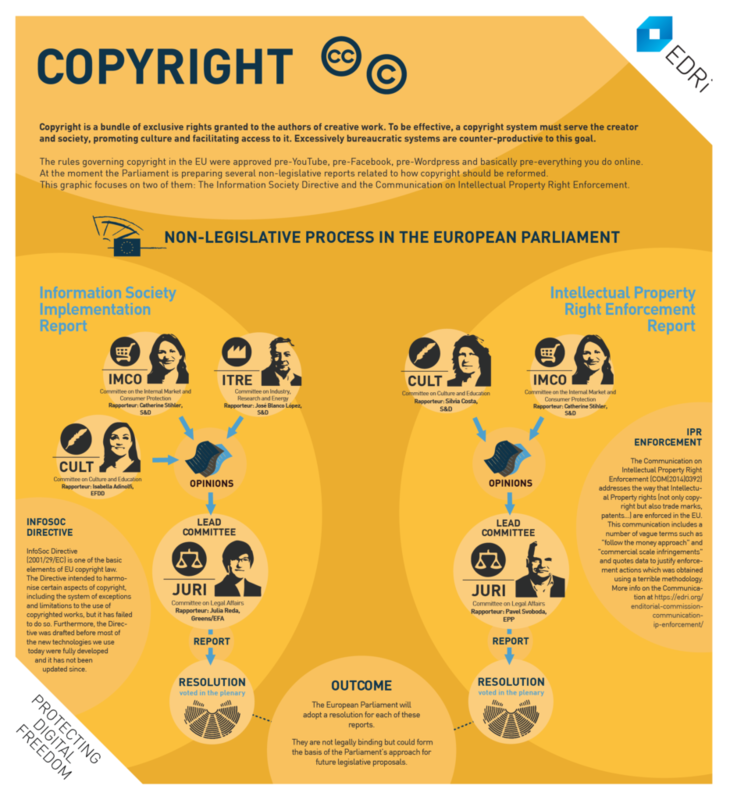 This report analyses a Directive which contains core elements of EU copyright law, including exceptions and limitations when using copyrighted material. It is generating input from different stakeholders and from different Committees in the European Parliament. EDRi is following every stage of the process and providing comments on the documents as they are published. The Committee of Legal Affairs (JURI) is responsible for this dossier. The Committees of Culture and Education (CULT), Industry, Research and Energy (ITRE) and Internal Market and Consumer Protection (IMCO) provide opinions and will submit a final set of amendments for a vote by the full Parliament. 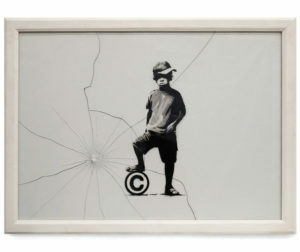 To convince the lead Committee to modernise the copyright system in the EU, we still need to keep pushing. You can go to the discuto.io consultation that Julia Reda has created and provide opinions on the report (see her own explanation of the report here). You can also email or call your MEPs in JURI to let them know your position. Our views on what needs to be done can be found in this briefing paper that EDRi has sent to MEPs in different Committees. Feel free to refer to that document (or download it and attach it in your email) so they can have a clear idea of what you support (assuming you agree with our analysis, of course!). Secondly, there is the draft Report prepared by Pavel Svoboda related to the “enforcement of intellectual propriety rights”. This report deals with aspects of the ‘IPR Enforcement Directive’ and more specifically with the Communication from the Commission to the European Parliament,the Council and the European Economic and Social Committee entitled ‘Towards a renewed consensus on the enforcement of Intellectual Property Rights: An EU Action Plan’ (COM(2014)0392). The lead Committee of this report is also the Committee of Legal Affairs (JURI). The Committees of Culture and Education (CULT) and Internal Market and Consumer Protection (IMCO) are providing Opinions. We have prepared a briefing paper on this dossier as well, where you can find our proposals. As for the previous document for Julia Reda’s report, you can use it when you call or email your MEPs in the lead Committee. See below our analysis documents on this dossier! For further information you can also consult our booklet on copyright. We also recommend having a look at the Report published by the United Nations Special Rapporteur in the field of cultural rights, Farida Shaheed. For Twitter campaigns, use the #fixcopyright hashtag. See below our infographic on both reports. Click on the image to see the full document. Clicca qui per l’infografica in italiano.